Attached is a letter executed by ACM Keller to CM Waz committing to restore benefits from the 2011 F/U. Please read Please read. Yesterday approximately 30 members attended the City Commission meeting for citizen comments. 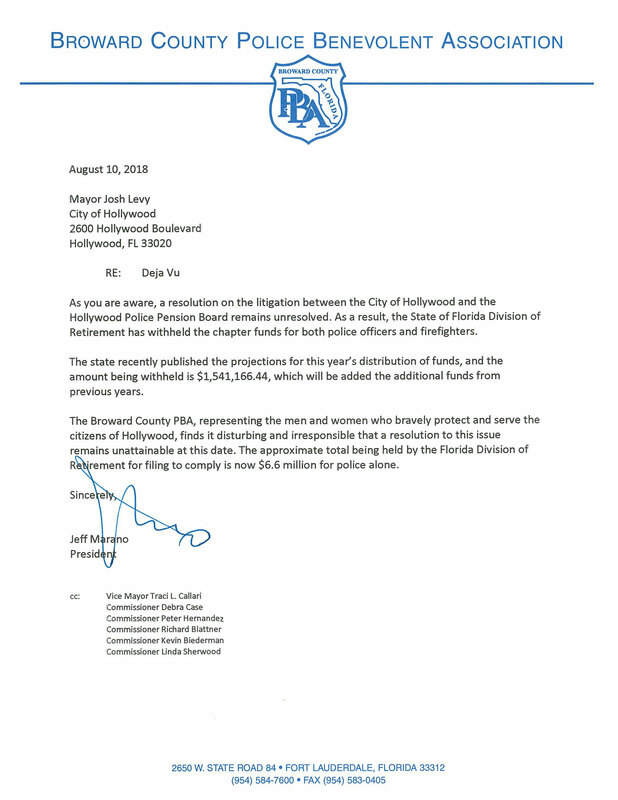 The PBA spoke on the letter and thanked the CM.ACM. I can assure you there is total different demeanor coming from the dais when members attend. We are confident that if we continue to show an interest in the direction the commission takes moving forward, the restoration will prevail. Keep up with the texts and direction of the reps. Hopefully we’ll be back to the table after the next/final budget meeting on 9/12/18 @1730. We have been at odds with the City in reference to the Emerald Hills special taxing district and the employment of HPD for a detail rate. We believe the members should be compensated at time and a half. Why? The district was created by ordinance and based upon other documents we have, believe it is the City. Very typical A. Fallick . . . just do it and see if we get away with it. We realize working off duty details is essential to survival. In this case we are asking members to boycott this specific detail and send a message! Shout out to retiree CR who grabbed ten CRA signs this week. Also Lt. L.O. has been getting locations for our PBA and grabbed some more this morning. Keep the pressure on. The unaware public is starting to pay attention to the CRA. City fails to comply. See attached.